Leonard Chong made his orchestral solo debut at the age of 10 and is the recipient of numerous grand and first-prize awards, both locally and state wide. He has performed as guest soloist with the Palos Verdes Regional Orchestra during the 2011-12 season, as well as with the Bellflower Symphony Orchestra, Beach Cities Symphony Orchestra, Culver City Symphony Orchestra and Brentwood Symphony Orchestra. Leonard is the honoree of multiple other awards, including 1st place and top prizes in the SYMF open solo competition; 1st in the junior California VOCE, and State champion in the 2010 California ASTA. Other awards include: Elizabeth Holburn, Gail Newby, Edith Knox scholarships, Rotary Club, among others. 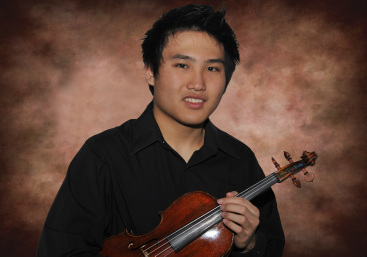 Leonard is the co-Concert Master of the PV Regional and has been studying the violin with Mr. Elmer Su since age 7. In 2012 he was an invited guest to play for the Manhattan Beach City Council and the city Mayor. For the 2013 season Leonard has engagements with the PV Regional Orchestra, Antelope Valley Orchestras, L’Hermitage Foundation and recitals in California.